Blue Jay - Spectacular Views of the Valley! WiFi and Fireplace! Blue Jay Cabin - Spectacular views of the valley!! Newly remodeled cabin - two bedroom plus bonus room, one bath cabin with a wood stove fireplace, FREE WiFi, cable TV, and DVD player. Fitted with all the conveniences of home, Blue Jay Cabin has a full kitchen with granite countertops and new appliances - stove/oven, refrigerator, microwave, blender, toaster, coffee maker, dishes, pots/pans, and more. This cabin includes a patio and charcoal barbecue. Walk to shops, restaurants, and the Alpine Slide for year round fun. Bedroom Two - bunk bed (twin/double). Bonus Room - twin bed. Blue Jay Cabin comes with fresh towels, and beds are made up with fresh linens and plenty of cozy blankets. Our dedicated cleaning crew has the cabin clean and ready before your visit and does the cleaning after your stay. Cozy little cabin near the lake and the village. We stayed for three nights. Very cozy, quiet and relaxing little cabin. 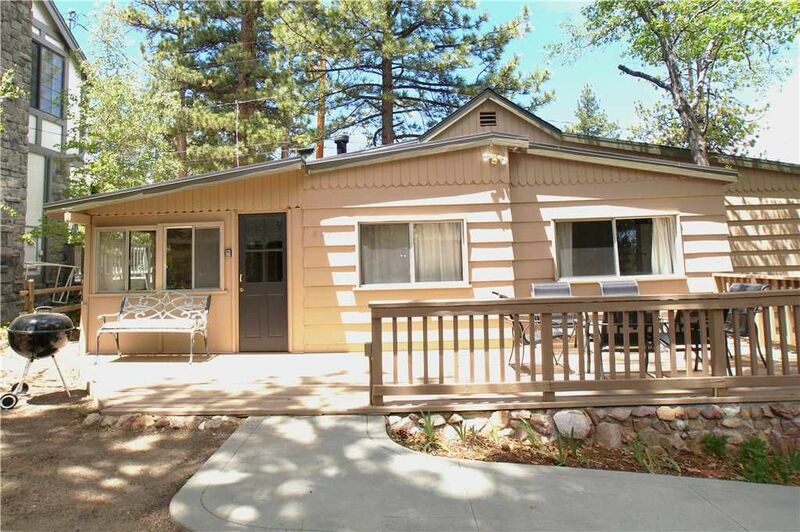 Very close to the lake, the village and hiking trails. Dear Eric. Thank you for your review and for choosing Cool Cabins. I’m happy that you enjoyed your stay and I’m looking forward to having you again as a guest in Big Bear. Charming. Great location. A table or two would enhance enjoyment of sitting in the living room. We really enjoyed our stay in the cabin. The driveway was so frozen we needed to put on snow chains (especially since it's a steep angle), which was a surprise. Also, the heater isn't central air so one room was very warm (where the heater and thermostat were) and the others were cold for much of the night. Overall, it was a "rustic" experience. It so spacious, Clean. If there's only either a half bath it would be perfect. It so spacious, Clean. If there's only either a half bath it would be perfect. Thanks for one day we enjoy it.